Preheat oven to 350°F. Spray a 9 x 5-inch loaf pan with nonstick baking spray. 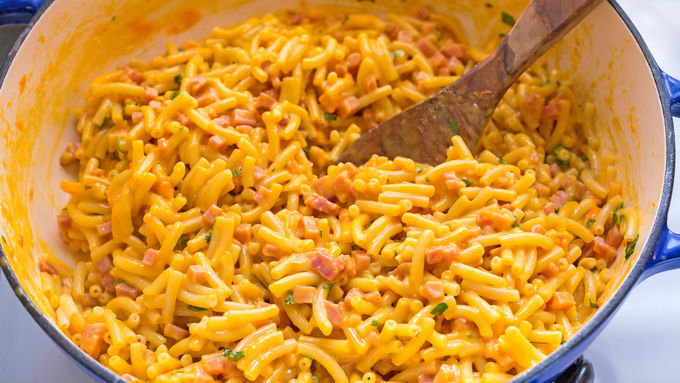 Boil macaroni and cheese until tender. Drain excess water. Add butter and cheese packets. Stir in ham, eggs, 1 1/2 tablespoons parsley and 1 1/2 cups cheddar. 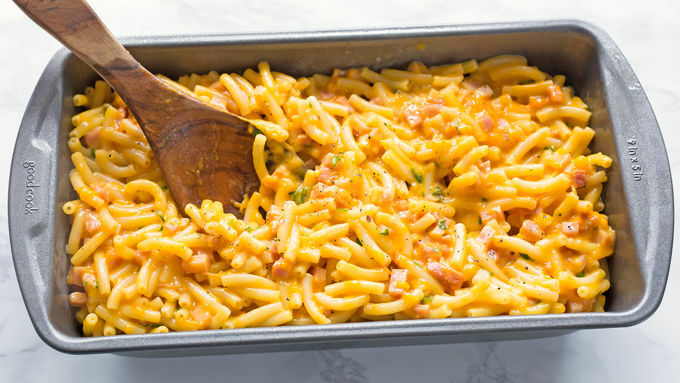 Spoon macaroni mixture into pan. Bake for 30 minutes, then top with remaining cheese and parsley. Continue baking for another 20 minutes. Remove from oven and cool in pan for at least 15 minutes before slicing and serving. We’re massive mac and cheese fans at our house. We love the boxed stuff. The homemade baked stuff. The slow-cooker stuff. And now, we love the loaf stuff. Which is 320947x more awesome than that sentence sounds. Imagine all of the convenience of an easy-slice meatloaf. Your whole meal in one perfect piece. 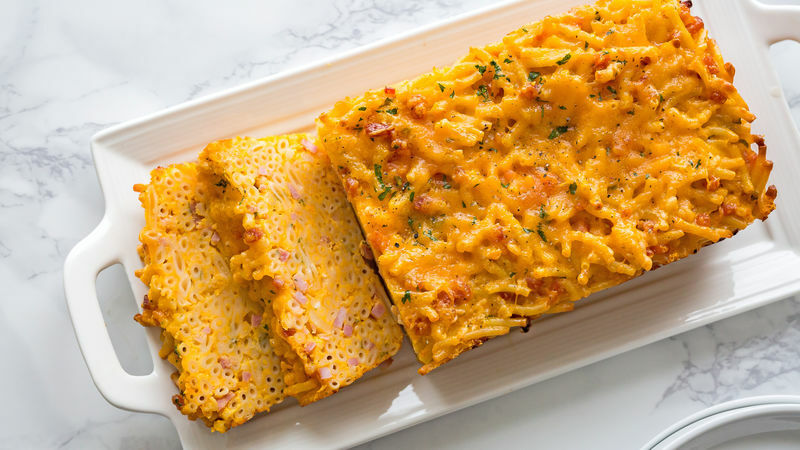 Then swap out the meatloaf for cheese Annie’s mac, sharp cheddar and tiny bits of ham. 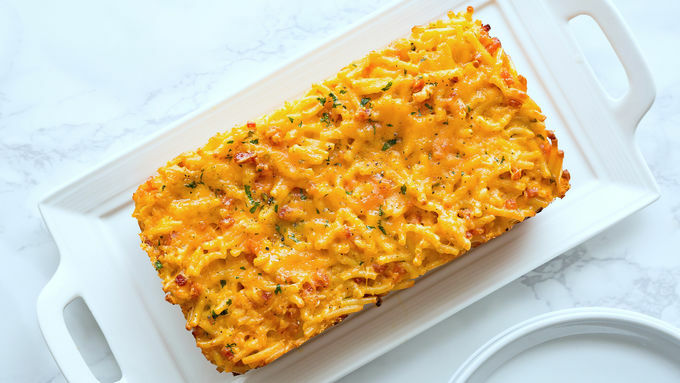 What you’ve got now is Macaroni and Cheese Loaf, which may just be the second-best meal ever (behind the all-time winner, which is regular mac and cheese). This recipe wins our “best retro twist on an all-time favorite recipe,” a title we just made up but will heretofore stick to. Because this recipe is awesome. So call over the crew and make a pan or two, enjoyed straight from the oven. Or make it for yourself at the beginning of the week, and have days’ worth of dinners just waiting for you to slice and microwave when you get home from work. Whether feeding a crowd, or enjoying by yourself (with a glass of wine, of course), this recipe is the perfect new way to enjoy an old classic.